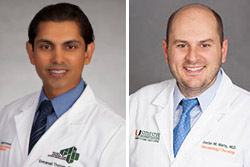 Miami CTSI K12 awardees are Emmanuel Thomas, M.D., Ph.D., left, and Justin Watts, M.D. Below are the recipients of the KL2 Awards. The awards provide up to 3 years of renewable support for the resesarch career of young investigators. See the KL2 Awards page for information about applying for funding. Congratulations to all the recipients.